This meeting has the capacity to be much worse than the Board meeting on September 29, 2015 when Trustees Mike McQuary and Richard Barrera presented a Proclamation to honor former Trustee Marne Foster on the same night they approved an investigation into criminal charges by the District Attorney that forced her to resign. Here are the 5 episodes of “FINAL 2016/17 BOARD MEETING DISASTER DUMP” where we describe how Superintendent Cindy Marten and Trustees Richard Barrera, Kevin Beiser, John Lee Evans, Mike McQuary and Sharon Whitehurst-Payne historically dump at least 5 disasters on all Stakeholders. And then Marten and her Crony Board will run away and hide until September, hoping we all forget. 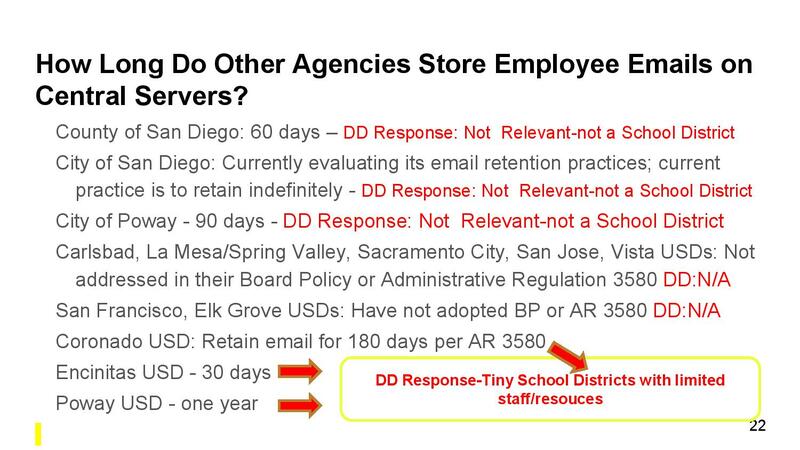 Most of our readers are familiar with our story about how San Diego Unified School District Superintendent Cindy Marten Implementation of Email Deletion “Policy” Without Trustee Approval Broke 5 Board Governance Policies. Our readers are also aware about how, after District Deeds broke the email deletion story, local San Diego Media jumped on the story and actually awarded the SDUSD the “Wall Award” for Not Valuing “Openness and Transparency” . Based on Section G, Item 3, it appears as though Marten is still as committed as possible to conceal her misdeeds by deleting email documents as soon as possible. In a poorly designed, ridiculous PowerPoint titled: Review of Public Records Requests Policies and Procedures, Marten must have told her staff to throw as much garbage against the document as possible to see how much of it would actually stick so she could reduce the deletion time period from unlimited to only 1 year. We won’t belabor our readers with a point by point destruction of Marten’s obfuscation and self-preservation strategies to hoodwink all SDUSD Stakeholders in the presentation. On the districts “computer”?!? Singular?!? WOW–we wonder what the CSBA thinks of storing email files on that interweb machine thingy! So it is clear that despite Supt. Marten being given examples of other similar School Districts (in size, LA Unified is #1, SDUSD is #2 and Long Beach is #3), Marten is proposing 1 year for deleting emails to cover up any and all incriminating emails as soon as possible. So based on this 1 year proposal, it must be that the COST is too high…Right? The mailbox service is free. 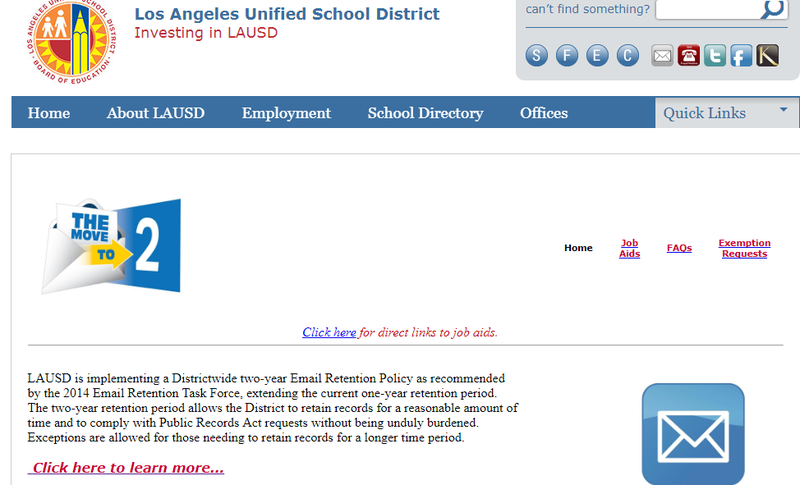 LAUSD Microsoft 365 Email System: $4.13 per mailbox…$161,070…for 39,000 employees…3 times the current number of employees…for UNLIMITED storage!!! By now the cost of a similar cloud based storage solution is probably around $2.00 annually or less. Marten must have laid off the wrong IT Techs!!! So where DID Marten seek out advice as to the best email retention policy? The outdated and simplistic recommendation by the California School Boards Association…which would work for 1 “computer”. THe “collaboration” with the SD SPJ which recommended 2 years of email archives that Marten ignored. Besides the ridiculous CSBA quote, District Deeds reviewed the SDUSD Email Deletion Presentation to the Board and found that there is not one single word or phrase that mentions any collaboration with any SDUSD Stakeholder individual, group, union, cluster (Hoover, Morse, Scripps Ranch, etc) , committee (DAC, DELAC, CAC, etc) or Board Member. It is not as if there are no examples of collaboration to make this decision. The Marten Kakistocracy obviously made no real attempt to create a believable case for her email deletion proposal. Marten is counting her Board of Education enabler cronies to just pass it as usual. Marten ignored meaningful COMPARISON with other similar entities and chose the ridiculous CSBA “computer” storage option as the centerpiece of her recommendation. Marten made no attempt to identify up to date cloud based options to drastically reduce COST while drastically increasing email storage capacity in her recommendation and instead used “on premise” hardware with a high labor cost for site maintainence as the COST estimate benchmark. Marten showed no proof that she COLLABORATED with any SDUSD Stakeholders on her recommendation and, in fact, IGNORED the public recommendation of the SD SPJ that actually tried to HELP the SDUSD make the best decision. The only reasonable conclusion that can be determined by Stakeholders for Marten to completely disregard any effective and valid Comparison, Cost and Collaboration processes and protocols for the email retention initiative is to ensure that she could quickly recommend, get approved and deploy “Rapid Email Deletions to Hide Corruption” within the SDUSD. “Transparency and Access to Public Information”?!? What a joke…just another Marten and Board of Education propaganda lie to SDUSD Stakeholders. EDITOR NOTE: “Follow” District Deeds so you won’t miss the Episode 3!! !